Since 1976, Captain Van Hubbard has provided his customers with courteous, professional, fishing charters, and excellent access to the inshore and near-shore waters. He started out around Tampa Bay moving to Boca Grande in 1981 to enjoy the awesome tarpon and snook fishery. He concentrates fishing from Boca into Charlotte Harbor and North to Venice, Florida. Providing quality tackle, Captain Van has numerous rods and reels to select from. This allows you to optimize every opportunity encountered on the water. This plus his over forty years local guiding experience ensures memorable adventures for anglers of all ages, and experience levels. We are each unique; all with different expectations and requirements. To help insure your fishing trip success, please communicate your ideas and wishes to Captain Van before your trip. There is flexibility with most aspects of your charter – for example – Capt. Van can make a stop for lunch or you can carry it along. The captain may target specific species or just go after whatever is biting – you will usually catch more if you target what’s biting (see the current fishing report). So please, let the captain know if you have any special needs or requests. Kids over 6 years old are always welcome, but young children do require FULL-TIME attention on a boat. Captain Van enjoys teaching kids of all ages to fish and specializes in Family Fun Trips! March through June is the area’s prime-time and early reservations are encouraged. Capt. Van will help you try to find another qualified guide if he’s already booked. Normal departure time is 8:00 am, but this can be customized. Fishing charters between March and November usually involve fishing with live minnows which Captain Van castnets prior to your arrival whenever possible. On tarpon fishing trips, a 6:00 am departure is encouraged and recommended. This will put you on the big Silver Kings at sunrise, and you’ll usually be hooked up before 7 am. Catching is usually better on weekdays because the weekends are more crowded. If you’re traveling a long way Captain Van suggests you schedule more than just one day charter. Multi-boat trips are always available to accommodate any party size. To avoid any miscommunications... Please take the time to familiarize yourself with the information below, as it pertains directly to what will take place the day of your fishing charter. Starting at $500 4 hours, family fun fishing for whatever is biting. We fish inside or near shore, Florida state waters only, and it’s your choice if weather allows. I do need to know in advance to bring proper gear. $100 per hour for additional hours on all trips. Snook, tarpon, permit, sharks, specific target species is $800 for six hours. Trolling trips for kingfish, cobia, etc… start at $650 because the engine is always running. We do have good fishing; but we have been discovered so it may require traveling more exploring to create opportunities. Rates include all but food and drinks. I clean the fish, provide any tackle and permits required. Reservations are suggested; especially if you are on a tight schedule. Last minute can work some times. Custom and multiple boat trips can be arraigned. Make your fishing reservation when you plan your trip for busy times. Please always call your captain before 7 PM the evening before your trip. Some days you need to call before you leave home if weather is still questionable. Please communicate your desire and confirm before either of us waste our efforts. If you change your mind at the dock after I get ready and run to pick you up, you forfeit your deposit. 50 % deposit required to hold your dates. I do not take credit cards. Deposits are refundable if the weather is unsafe; lightening or Small Craft Warnings in effect, if we can’t reschedule. If you drop any equipment overboard, it will be your responsibility to pay for the replacement. Please wear boat shoes for your safety; No dark soles that mark the boat decks are permitted. Bare feet are fine. Light cotton is great when it’s warm. Beer and wine are fine; whiskey is risky. Sun screen, and polarized sun glasses are important to your comfort. When we agree on departure time the clock starts then. My job is to do the best I can to catch fish while safely entertaining you. Happy customers make me new friends and are the best advertising money can’t buy! There is always good fishing year-round in Southwest Florida, however, some fish are seasonal and only available certain times of the year. Family Fun Fishing – Up to six passengers, with maximum of three fishing at a time. Anglers of all skill levels will have fun, and catch fish!… Targeting whatever is biting. Mixed Species Trips – Fishing Spanish & King Mackerel, Cobia, Barracuda, sharks, Permit, & more. 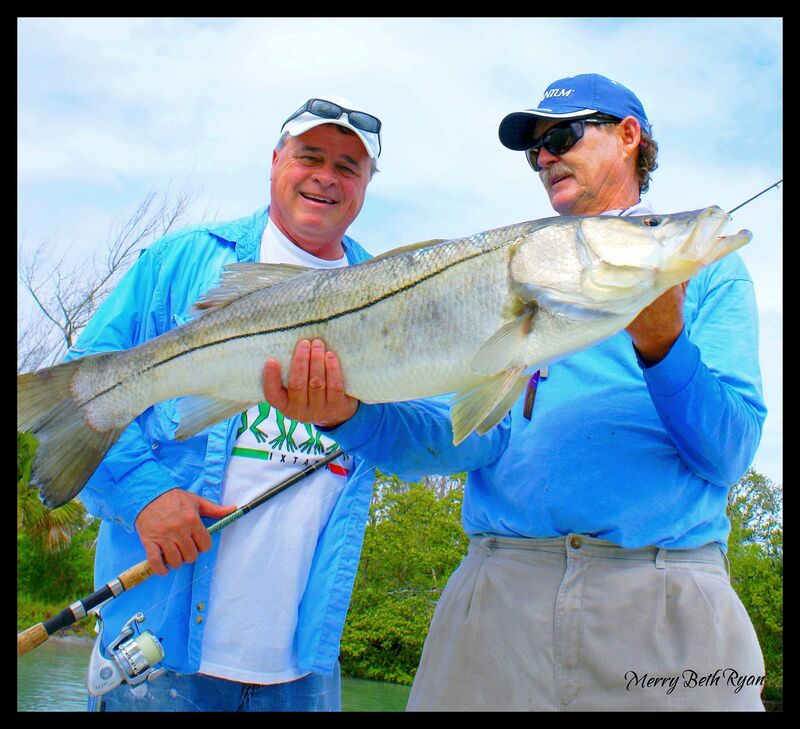 Specialty Seasonal Trips – Captain Van’s Premium Tarpon, & Snook Trips. Up to six passengers, but two active/casting anglers (possibly three snook fishing) at once. Location Most charters depart from Stump Pass Marina, located on the mainland between Englewood and Boca Grande. The marina is located about an hour South of the Tampa Bay area, less than and hour South from Sarasota/ Bradenton, about, and around three hours from Orlando. Pick up at other sites can usually be arranged; any additional compensation depends on the time and distance. The Captain can’t control the weather or tides so you must be willing to work around Mother Nature’s moods. Weather can create challenges. Captain Van does fish in less than perfect conditions and will make the best of what Mother Nature dishes out. If we have planed to fish outside (nearshore), and the conditions are too rough, then we’ll fish inside (inshore). Lighting, Small Craft Warnings and unsafe conditions are beyond the Captain’s control and refunds are available for these instances, but of course, we’ll try and reschedule if possible. Back in the saddle again; the waters are fine let’s go fishin’. Copyright © 2017 Captain Van Hubbard. All Rights Reserved.